Remember the super-cool wall PC interface that Tom Cruise manipulates with his hands in the sci-fi flick Minority Report? A team of PhD students led by Daniel Stoldle at the University of Tromso, Norway, have developed a display based on the same concept. Only it is used not to summon images of the future from captive precogs minds, but to navigate through your comic collection! Incredible as it sounds, the researchers were able to come up with a large scale display that could be manipulated though hand gestures. The mammoth display has a 7168 x 3032 resolution (over 22 megapixels!) which is synced with a grid of 28 video projectors. Using a system of 16 cameras and 9 computers, the program detects user movements and allows them to manipulate the screen image. You can rotate, pan, tilt, and scale the images and go through almost a three year wide comic collection almost instantaneously. A double snap zooms in the image and a single snap zooms out. 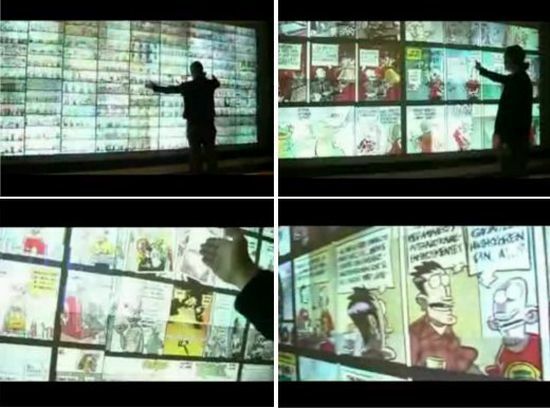 The project is being considered a giant step towards using developing gesture-controlled large-scale displays. For now though, you will have to contend yourself with using it for comics. Watch the how-to video below. P.s. you might need to get another apartment to house this baby! It’s black, it’s treasure, it’s a clock! ‘Ice light shower’ from Visentin!